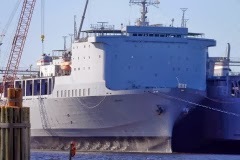 The MV Cape Ray, the U.S. ship that will serve as the lynchpin for the destruction of Syria's most toxic chemical weapons, is preparing to leave Virginia in about two weeks for what will be an unprecedented, complex mission, AP reported today. The ship is currently pierside in Portsmouth. The chemicals from 12 storage sites in Syria need to be first transported to the port of Latakia. The most highly toxic chemicals, including materials used to make mustard gas and sarin, will then be transferred from the trucks onto cargo ships by 31 December, which will carry the cargo to an Italian port, where it will be loaded onto the Cape Ray. The 700-foot Cape Ray, which is owned by the Transportation Department's Maritime Administration, will be turned over to the U.S. Navy's Sealift Command once it leaves Virginia. It will need about 10 days to get to Italy. The special machines aboard the ship, called Field Deployable Hydrolysis Systems, will make the chemical warfare material inert.